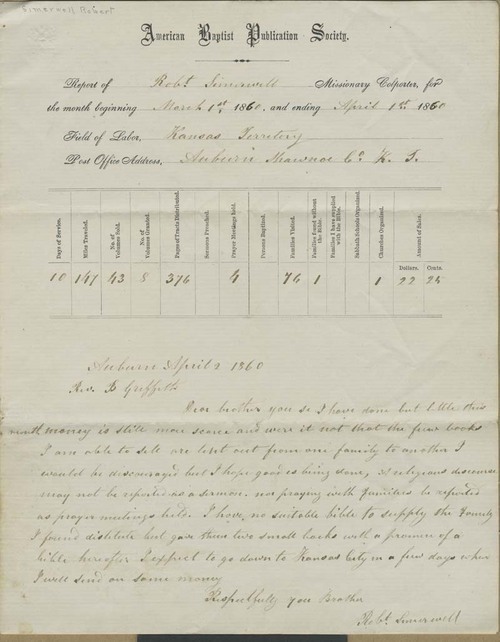 Robert Simerwell, a missionary colporteur for the American Baptist Publication Society, made this report to the headquarters in Philadelphia. It includes a tally of the number of miles he traveled, the number of tracts and volumes he sold, and the number of families visited, along with other information about the religious lives of Kansas settlers. The bottom portion of the report contains a note from Simerwell to Rev. B. Griffith, dated April 2, 1860. In general, this report provides valuable information about the demand for religious supplies in Kansas Territory.